I have been listening to Beethoven's music for many years, and have recordings of Beethoven by von Karajan, Abbado, Rattle, Kleiber, Bernstein and Levine to name a few. I also had the opportunity to see Claudio Abbado and the Berlin Philharmonic perform the Eroica symphony live several years ago in Orange County, California. Needless to say that was the definitive performance for me. I only recently bought this boxed set of Bernstein's symphony cycle from Vienna in the late 70's. I was pleasantly surprised to realize how much I grew to love this set very quickly. It also has a good deal of historical significance as well, considering Bernstein was a Jewish American conducting music by the greatest German composer who ever lived in Vienna, only 30 years after World War II. It is astonishing to hear how the orchestra is so obviously and completely under Bernstein's command throughout these symphonies. It is a wonderful collaboration. Berstein's approach overall is very broad, with a lot more histrionic tempo changes and dynamic extremes than is customary for Beethoven performances, but it is utterly captivating as far as I'm concerned. Only the performance of the 5th taxes the patience, with its lugubrious pacing in the first movement. I think the 3rd, 7th and 9th are particularly good performances. Under Bernstein, the 9th becomes a leisurely yet powerful journey through this most amazing of symphonies. The soloists in the finale make an absolutely heavenly quartet, even if Kollo is a bit taxed at times. Gwyneth Jones and Kurt Moll both shine, with her creamy high notes and his sepulchral heft the finale becomes more operatic than ever before, and the final quartet before the eruptive finale is performed slowly and intensely so that the listener can follow every exquisite note from each singer-for me this is one of the most immaculate moments I have ever experienced in all my years of listening to Beethoven recordings. It seems to last for an eternity and sounds as if one is ascending into heaven itself. The concluding eruption is taken very fast and builds to a very emotional and grandiose conclusion. Critics have accused Leonard Bernstein of being too idiosyncratic in his interpretations, and some have claimed that his later recordings with Deutsche Grammophon were too flamboyant. I tend to disagree, since I have enjoyed listening to his Beethoven and Brahms symphony cycles with the Vienna Philharmonic and virtually all of his Mahler symphony recordings. Bernstein was as comfortable conducting Beethoven as he was with Mozart, Haydn, Mahler, Sibelius, or Copeland, to name but a few. And there were only a handful of orchestras with whom he had a great relationship, of which his partnership with the Vienna Philharmonic Orchestra surely ranks at the top, perhaps even more so than his critically acclaimed relationship with the New York Philharmonic Orchestra (I might add that he is still remembered by musicians in the Vienna Philharmonic Orchestra, who regard him as one of the most inspirational conductors with whom they've collaborated with.). These Bernstein/WPO performances and DG recordings are good of course, how could they be bad. Even so, this symphonic cycle doens't make it into the top ten of Beethoven's symphonies and it should certainly not be anyone's first or only choice. Fans of Bernstein will probably give it five ***** stars before or even without a hearing and it is a very attractively priced for which I'm grateful. Personnaly, I prefer a conductor who tries to the best of his ability to play the composer's music and less the conductor's interpretation of the same. I see that the reviewers here are sharply divided between champsions and naysayers. I'm not completey disappointed. The smaller, more graceful symphonies (#1, #2, #4, #8) are the best in the cycle, largely thanks to the orchestra's elegant execution. Of the heroic symphonies, the Fifth is dull, the Eroica and Seventh are better but by no means inspired, and the Ninth comes the closest to making one sit up and take notice. LB made a specialty of this work, but his three official versions don't really capture the magic. This one comes closest, and I much prefer it to the emotional wallow that LB indulged in with his famous "Ode to Freedom" performance at the Berlin Wall after it fell in 1989. Not the best, but not a disappointment. I must admit, I was quite worried upon hitting the "pay" button after ordering these symphonies, because I then read the reviews. I figured (without doing my homework) that LB and LvB in combination were sure to be perfect! A few others felt that these were weak and not up to the Bernstein or Berlin standard. And upon my first listen (I've only been through the whole thing once), I will agree this isn't always quite as spectacular as I would have imagined. Many times the starts of the symphonies are a little hesitant and weak (perhaps the two forces were still getting used to each other?). Usually, once the group gets into the symphonies it is quite wonderful. Perfection? No. But there are some wonderful sections of each symphony. There are some spots of pure Leonard Bernstein magic. I feel the 5th is quite a good take (bravo horns in mvt iv!). Symphony 3 is also tasty at times. 7:2 grips me as it always does. The ending two movement's tempos of Symphony 7 are quite bright and produce a brilliant result. However, what is NOT too well advertised is that these are ALL live takes. These are all live recordings. And let's face it - it's hard to get it right the first time, everytime! I feel this is most noticeable in the Finale to the 9th symphony. With all the sudden stops and starts that Beethoven wrote, and for all the forces required to play this - it makes for quite a feat to pull off in any circumstance. And it just didn't quite happen here. Most of the transitions are weak and take a while to get into - and it happens in nearly all of them. This Beethoven set was the first one I purchased many years ago; I "learned" many of the Beethoven symphonies through Lenny and the Vienna Phil. I couldn't have asked for better teachers. Actually, Bernstein is more like a tour guide through the mountains. What he shows you eludes so many other conductors who supposedly rule this terrain. Bernstein is often overlooked or diminished as a conductor of the standard classical reportoire, but he was often just as brilliant with Mozart or Beethoven as he could be with Mahler or the Americans. Unlike the Sibelius or Elgar recordings from this new Bernstein Edition, his Beethoven set is a great place for anyone to begin with these works, and I still place it toe to toe with any of the other contenders. As for those who already own other DG sets by Karajan, Abbado, or Bohm, or have legendary sets by Szell, Walter, or Furtwangler, give this one a try, especially at the bargain price, and see where Bernstein and the Vienna Philharmonic take you. A word of caution. No journey through Beethoven is perfect, as every set has its mis-steps (some result in total disaster). Bernstein's only flaw here is the Fifth, where he favors a slow and old-fashioned performance. But this is easily remedied: simply buy the Kleiber recording with the same orchestra, also from DG, and you will have years of great performances to relish. Great Interpretations but Patchy Sound Quality! I Was Hoping for Some Special Insights from Bernstein but Who Was I Kidding? All I got was some very average Beethoven performances from Leonard Bernstein, a conductor usually renowned for his extrovert, fascinating approach to various music but who so misses the mark with this dull cycle of the greatest symphonies of all time. One of the main problems is possibly the fact that Bernstein chose to record this cycle, ( his 2nd cycle of Beethoven symphonies ), with the Vienna Philharmonic. His earlier one was with the New York Philharmonic and that was a lot more youthful and vigorous. These Vienna versions are much more mellow and relaxed, I love the Vienna Philharmonic but they've played this music to death and I don't think they can really be inspired, full-throttle like a younger, less tradition ingrained orchestra. And to add insult to injury, Karajan's Berlin Philharmonic was always much superior in these years in terms of virtuosity, finesse, power and everything you need to feel the impact of Beethoven. Still, the Vienna Philharmonic is one of the finest orchestras in the world and it leaves it up to the conductor to truly inspire them. This is where Bernstein fails, every single one of these symphonies is safe, lackluster and middle of the road. Let's take a quick, one by one analysis of the works. Symphony 1 is done with charm and grace, Bernstein obviously enjoying the mood but I miss the sprint and attack that Karajan brings to this music. 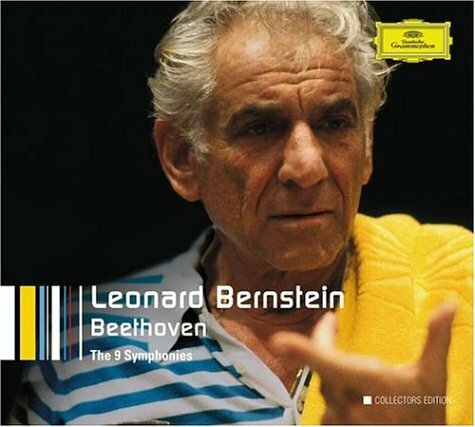 Symphony 2 is where Bernstein truly shines, he puts in plenty of power and concentration throughout and the slow movement, the larghetto, is gorgeous. All in all, a success. Symphony 3, the Eroica is where the trouble starts. It's boring, it's deflated, it's dull compared to Bernstein's earlier New York version and Bernstein typically falls flat on his face when compared to Karajan or Furtwangler in the Eroica. The funeral march by Bernstein can put you to sleep, where is the emotional gravity that Karajan brings to it in his devastating digital record? Symphony 4 is good but not great, a general run through with a few interesting touches. Symphony 5 is a dismal failure, the famous first movement is the worst I've ever heard. It's obscenely slow, 8 minutes, 38 seconds! Compare that to most versions which average like 7 minutes, 20 seconds. The rest of the symphony is nothing special but at least better than the atrocious first movement. The Pastoral symphony is well played but isn't in the league with Karl Bohm or Bruno Walter. Symphony 7 is one of the best performances of the Bernstein cycle, with lots of energy and drive. Symphony 8 is humorous and lively, not massive like Karajan, but that's ok.
All Beethoven symphonic cycles are eventually disappointing because no one conductor can approach perfection in every one of these works. Bernstein succeeds in symphonies 2 and 7 in this set, but that's really it, the rest are average or worse. Karajan's early 1960's cycle is the one to go for if you desperately need a complete set by one conductor. It's not perfect but the most satisfactory available. For individual symphonies, try Karajan in symphony 1, Karajan, Szell or Bernstein in symphony 2. For the Eroica, Karajan's digital version if you want drama and power or Klemperer from 1961 if you like it slow or Toscanini from the good old days. Szell and Furtwangler are also great. Symphony 4 goes to either Szell or Karajan, Symphony 5 to Giulini, Furtwangler, Karajan and Kleiber. The Pastoral goes to Karl Bohm or Bruno Walter. The 7th goes to God knows who, I haven't found a perfect Seventh, yet! Try Thielemann, Furtwangler or Bernstein or Karajan's first DG cycle. Go with Karajan's digital version for the 8th symphony. Last but not least, Solti, 1972 for the the Choral Symphony or Gunter Wand on RCA, as well as Karajan, 62, 77 and Furtwangler, 51, 42, all great. the most heartfelt performances of Beethoven that money can buy. These Beethoven performances are loaded with personal touches. Bernstein's own feelings and thoughts are shamelessly printed on many passages - and it's very moving. For example, try the Mahler-like lyricism of the slow movement of second symphony or the bass-heavy treatment of the 9th symphony's 1st movement. Some fast passages are breathlessly intense. Some lyrical passages are painfully heartfelt. You may not always agree with his choice of tempo but it's not really up to you, is it? There are countless moments where things get very emotional, sometimes at the expense of sonic balance. The singers in the 9th sometimes get too excited they almost sing out of tune. But they sure sound possessed. The recording is clean and natural. I know there are some who will complain about the dry, uneven sound but I think Bernstein himself is the one responsible for that - lack of care on sonic beautification. Again, that's not what Bernstein was shooting for.